The High Street building also home to estate agent Jim Hay's offices. Approval has been granted for the conversion of an office complex into new homes in Hawick High Street despite concerns that would risk the destruction of a “historical treasure”. The building’s ground floor is currently occupied by estate agent Jim Hay’s offices and is home to a meeting room, archive, staff area and store at ground-floor level. Under the plans now given the thumbs-up, the estate agent’s office will be retained, but the ground and first floors of the rear wing of the building will be converted into a couple of two-bedroom homes. 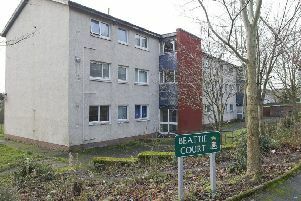 The three-storey property is considered to be of historical significance, being the last example in Hawick of what was once a common method of building in the town, with access to upper storeys being gained by outside stairs. The plans have raised the hackles of members of Hawick Archaeological Society, among them Alastair Redpath, its honorary secretary. He said: “During my tenure as honorary secretary, the grade B-listed Wilton Mills complex has been demolished, along with one of the few surviving World War One-era huts from Stobs Camp at Trowmill. Duncan Taylor, president of the society, added: “This is one of only two surviving examples of what had been the traditional method of building houses in Hawick. However, in a report to councillors, Julie Hayward, the council’s lead planning officer, said the site was in a new core activity area, a status allowing a mix of uses appropriate to a town centre to encourage public activity and footfall within the town centre. She said: “It is considered that this proposal can be supported in this instance and that the benefit of the continuous use outweighs the need to revert back a retail unit within the core activity area. “Refusal of this application and potentially enforcement action to secure cessation of the unauthortised use would result in a vacant unit within the High Street which would do nothing to enhance the vitality and viability of the town centre. “It should be noted that the approval does not set a precedent for the future loss of class-one units within the core activity area. “Hawick High Street is characterised by a mix of uses such as shops, banks, takeaways and public houses. “Many of the properties are in residential use above ground-floor level.